So here I am in Kansas. The town is not “Ashtanga,” it’s actually Louisburg, Kansas. Population 2,576. 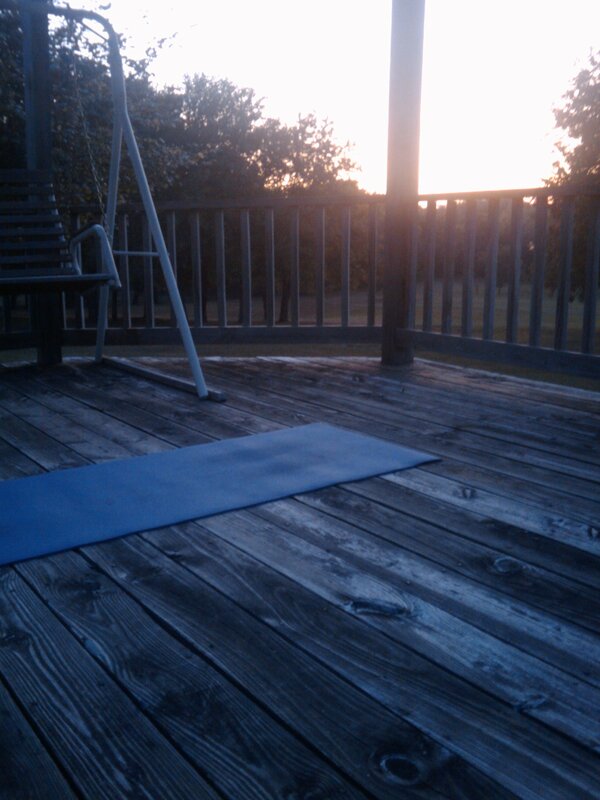 However, I’ve been doing my Ashtanga yoga practice at dawn this week, in the gazebo. This morning the full moon was setting behind me and the sun was rising in front of me as I did my Sun Salutations (aka Surya Namaskar A and B, to those inclined towards Sanskrit). The soundtrack was roosters, cows, horses, and the occasional yipping and howling of coyotes. Cool, dry air and the smells of grass and sweet autumn hay. In case you’re wondering, I’ve not sold my Jeep nor given up my cell phone. Turns out roaming charges ain’t what they used to be (in a good way), so the cell phone stays active for the time being. And the Jeep is getting good use by good friends until I decide whether to sell or drive it back up to Maryland. In the meantime, I’m visiting my aunt and uncle and my grandfather here in Kansas. My Mom and I drove out last week: 2 days of driving beneath the gloomy blanket of clouds that Hurricane Lee was dragging behind him. The fog and low clouds were spectacular through the Blue Ridge Mountains in western Maryland. Ohio was not as awful as I make it out to be, although you can feel the ache of economic depression even from the highway as you drive through struggling towns and struggling farms. Indiana and Illinois brought 43 miles of intermittent roadwork, which slowed down the trip a little bit, and then things brightened when we got to Missouri and the skies cleared. Now I’m settled in rural Kansas for a few more days. Grandpa is as quietly clever as he ever was, dropping wry little comments into the conversation and chuckling to himself when a stray comment amuses him. I realize, on this trip, how much of my own wisecracking ways come from my Mom’s side of the family. It’s constant comedy improv. Amidst all the steadfast Kansas culture, it’s interesting to be doing Ashtanga yoga in the mornings. It’s not as predictable as doing yoga in an incense-filled studio, or even a gazebo on the California coast; it feels all the more invigorating for its unexpectedness. Besides which, I need something to offset the Kansas country cooking so I can still fit into my clothes when we head back to Maryland!